You guys, it's been so hot here! I kid not. HOT. I have no idea what happened, but for some reason the weather decided we So Cal-ians didn't need to enjoy a winter. Sure, we had some cooler days around the first of the year, and by golly I think I wore my heavy jacket once! But for the last 3 weeks....it has been in the upper 70's-80's! I mean...what in the world? You'd think it was July. It's not. It's January. It's winter. My friends in other parts of the country are freezing and wearing wool socks. I'm here in tank tops and shorts, with fans on and lots of iced beverages...and lucky if I get enough deodorant on before I become a sweaty hot mess in the morning. Sheesh. Remember that Honey Meyer Lemon Curd I made last week? Remember how I said it was for my dad's birthday dessert he had "very specifically" and with the upmost detail, asked for? Remember how I said I would share that fun little refined sugar free dessert with you all? Well friends, today is the day. Like mentioned in that previous blog post, my dad needs to stay away from as many sugar filled and fatty desserts as possible. Of course being a human being, he needs to splurge every once in a while, and if I can help it I try my hardest to make sure that splurge is on something better for him than say...donuts. There's lots of weirdly sweetened dessert recipe trials going on around here! Anyway, this past birthday he had a very specific dessert request. Being a lover of lemony things, he had found a picture (I'm assuming from the internet somewhere?!) 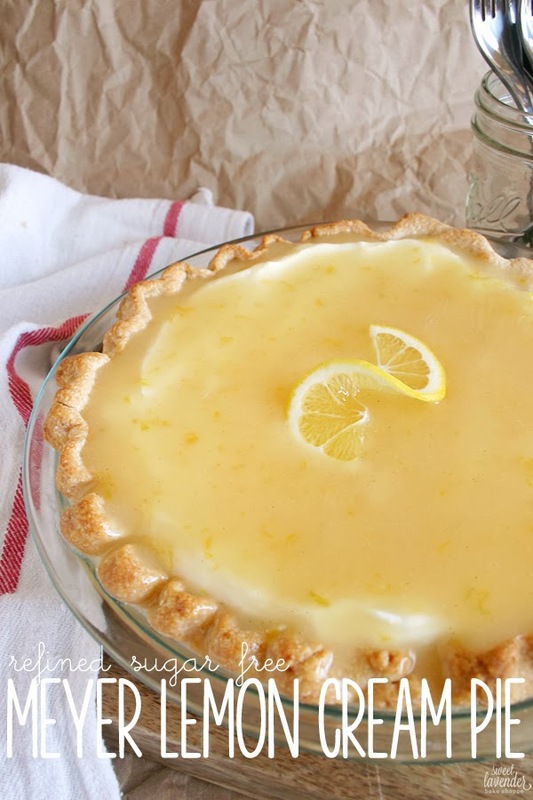 of this cream pie looking thing with lemon (curd?) on top. "I want this" he said. "...Ok....What is it exactly?" "A lemon cream pie with some sort of cream cheese mousse." "Awesome." Because there are some health issues that limit the use of honey as a sugar alternative, I kept it to a minimum in this pie. BUT still wanting to refrain from using any refined sugars, I decided to use a very his-specific-health-issue-friendly-sweetener: Stevia. Have you guys played around with this stuff yet? I personally love Stevia. I use it every single day. I use it in its powdered form as well as its liquid, depending on what I need it for. The liquid version is about 300x sweeter than granulated sugar and the powdered, a bit less. Either way, this means you only need a little bit...which can make baking and cooking with it a tad tricky. Also tricky? Depending on your brand of liquid stevia, the more you use, the higher the risk of a bitter after taste! Blarg. I was determined though. It needs to be said that there is a big difference between powdered stevia, clear liquid stevia, and pure liquid stevia. Make sure you know which one you have. The pure liquid stevia will be the strongest sweetness of all and thus needs to be adjusted accordingly when adding. For this pie and the amount listed, I used clear liquid stevia which is made up of a mixture of water, vegetable glycerin and stevia. Again, please check your ingredient list on your particular brand of stevia. To add the 1/2 teaspoon amount I listed, you'll need to have the clear liquid kind. I picked mine up from my local Sprout's Market. Why go through all this trouble? Because once you get the hang of your particular kind of Stevia, your door to Unrefined Sugar Dessertland just opened wide and bright. Plus, Stevia is calorie free (versus maple syrup or honey) so that's nice. Also, if you have any sort of health restrictions limiting sugar (diabetes, Paleo, etc) this is an amazing sweetener to have! Depending on how closely you are watching your sugar intake, the pie dough you use will vary. If you are watching it pretty strictly, I'd recommend making a whole wheat crust, but omitting the sugar. Or else, making a regular pie dough and again omitting any sugar that might be included would help too. Remember, white flours turn into sugars a lot easier in the body. If you are using a store bought pie dough, follow the package instructions up to the baking part. 2. Once your pie dough is made, whichever route that was, flour your counter and roll out dough to a 1/8-1/4" thick disk about 1 1/2-2" wider than your pie pan. 3. Place dough into your pie pan and crimp edges however you see fit. For a easy way to transfer pie dough to your pan, click here. 4. With a fork, prick pie dough all over, making sure to get both the bottom and the sides. 5. Place a sheet of tin foil (or parchment) big enough to cover sides and bottom of crust into pie pan and fill to the top with pie weights, dried beans, or uncooked rice. What you are doing is weighing down your crust so that when it pre-bakes, it won't puff up! 6. 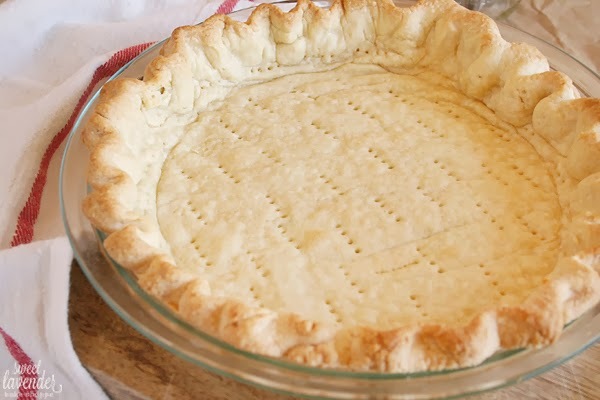 Place pie crust into the oven and bake for about 15-17 minutes or until edges are becoming golden brown. Remove pie crust from oven and remove tin foil/pie weights carefully. If your bottom crust is still a bit undercooked, place back into oven and cook another 5-7 minutes more, or until cooked through. Watch your edges! 7. Allow to cool completely before filling. Again, it needs to be repeated that there is a big difference between powdered stevia, clear liquid stevia, and pure liquid stevia. Make sure you know which one you have. The pure liquid stevia will be the strongest sweetness of all and thus needs to be adjusted accordingly when adding. I would recommend beginning with 1/8 teaspoon and adding incrementally till it's to your liking. 1. 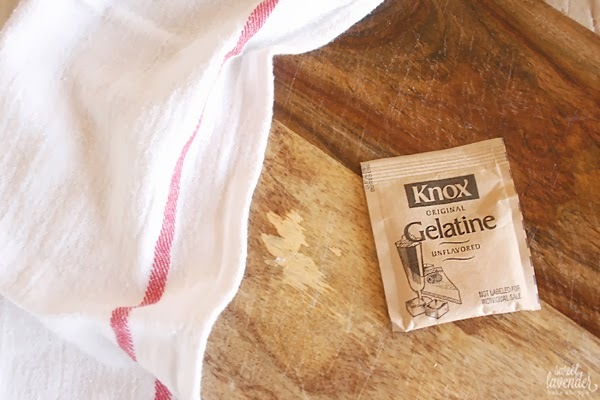 In a small sauce pan, add your 2 tablespoons of cold water and sprinkle your package of unflavored gelatin on top. Allow to sit and bloom for about 5 minutes. You will see the gelatin soak up the water and become a super thick, squishy mound. 2. Once this happens, add pan to a very low heat and cook for about 15-30 seconds or until the gelatin completely melts. This will happen pretty quickly and at a very low temperature. Watch it, you do not want this to boil or burn your gelatin. Remove from heat and set aside. 3. In a bowl of a stand mixer fitted with a paddle attachment, and on medium to medium-high speed, beat your room temperature cream cheese, stevia (again, adding incrementally until it's to your taste), Meyer lemon zest, and vanilla extract until light and fluffy. Stop mixer, scrape down, and add your lemon juice. Beat again until incorporated. 4. Remove paddle attachment and switch to your whip attachment. While mixer is on medium-low speed, add your cold heavy whipping cream. Turn speed up and whip until soft peaks form. Stop mixer and scrape down. Next, while mixer is on medium-low speed again, slowly add your cooled liquified gelatin. If by this time your gelatin has solidified again, gently reheat on low until completely melted. Add as described. 5. Turn speed to medium-high and beat until medium peaks form, about 2-3 minutes. Be careful not to over mix. 6. 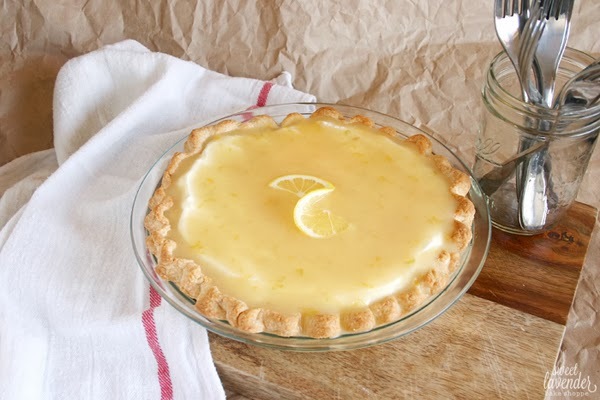 Add lemon cream to your pre-baked completely cooled pie shell and smooth out. Place pie into fridge to completely chill- at least 30 minutes. This is the same recipe for my Honey Meyer Lemon Curd. I just love it so! It has all the flavors you would expect in a good old fashioned lemon curd, but with the added bonus of being both refined sugar and egg yolk free! It's slightly sweet from the honey and very tangy. A perfect amount of tartness for any of you lemon lovers out there. 1. Add your butter to a small bowl. Set aside. 2. Whisk together your almond milk and cornstarch in a small non-reactive pot, until all lumps are gone. Then, add the rest of your ingredients, except butter, and cook over medium until mixture comes to a simmer. Stir frequently. 3. Once mixture is simmering, lower heat so that you have a steady simmer. Do not boil. Cook, stirring frequently, about 5 minutes. Mixture will thicken up quite a bit. 4. Remove from heat and pour curd into your bowl with butter. Mix in butter and allow curd to cool 15-20 minutes, stirring every so often. Pour curd over your chilled pie and smooth out as needed. Curd will thicken up substantially, when cool. 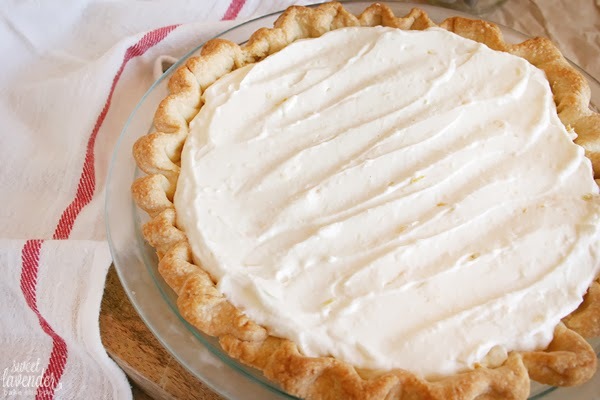 Top pie with more whipped cream or simply with a slice of fresh Meyer lemon. Slice and serve! Pie will last in a fridge for up to 3 days. Best if eaten that next day. I've been wanting to try Stevia in my coffee for awhile but I'm worried it will taste too processed (horrible memories with splenda running through my head.) Have you been pretty happy with it? Also, I'm so with you on this weather... I think this morning was the first time I've been able to actually drink HOT coffee! Here's to hoping it cools down a bit soon! I love Stevia, but honestly- A LITTLE GOES A LONG WAY. It is one of my favorite sugar substitutes to date. Well that, and honey. I use it every single day in my tea, coffee...etc. I've used it in oatmeal, in cereal...gosh...pretty much everywhere. My only caution would be that if you add too much, it will be unbearably sweet (and could have a bitter aftertaste). So, depending on what form you buy, start small and add more in tiny increments! But, being 100% natural, it's 397856649x better than Splenda!! Which, as we all know is bonded to chlorine molecules! Eeeeek!